Last autumn when I gave a talk to the Inverness Nordic and Ski Touring Club on my ski tour with igloos trip to the Wind River Range in Wyoming (see post for May 1, 2009) some members were interested in building an igloo in the Cairngorms. Despite the very snowy winter it was not until yesterday that an actual igloo trip took place. All the low level snow having gone four of us climbed up onto the vast Moine Mhor (Great Moss) above Glen Feshie and found a suitable spot where the snow was still several feet deep at about 950 metres on the eastern side of Carn Ban Mor. The situation was superb with nothing but snow-covered hills on all sides and a real sense of space and wilderness. I’d brought my Ice Box, that ingenious igloo building tool invented by Ed Huesers, and showed the others how it worked and how to construct an igloo. Never having taught igloo building before or indeed even built an igloo without other far more experienced igloo builders taking the lead I was very glad that the heavy damp spring snow formed blocks easily as this made the construction much simpler. Building the igloo took around four hours, during which time the hazy sky cleared and the late afternoon sun shone down. It was very hot. Too hot in fact. After we’d completed the igloo the sun melted a hole straight through one side, a neat circle directly in line with its beam. I later learnt that it was the hottest day of the year so far, the temperature reaching 19.4º in Aviemore. The hole wasn’t that big though and patching it seemed feasible, especially as the temperature fell rapidly after the sun had set. However I wasn’t staying the night and skied off across the plateau as Andy, Christine and Rob packed snow into the “window” in their igloo. The snow on the descent of Carn Ban Mor was wonderful slick spring snow on which turns were fast and easy, the skis almost turning themselves. It was the best snow for downhill skiing I’ve experienced all this long season. Below the snow I stumbled down the rocky path in growing darkness as the stars came out and glittered in the black moonless sky. As I walked down the glen to my car I stared out at the unimaginable immensity of the universe. Our solar system, I thought, was just a tiny speck in the cosmos and planet Earth was just a tiny speck in the solar system and I, trudging tired, thirsty and aching down the road in the dark, was just a tiny speck on the surface of the planet. That I could know this, that I could even think of myself in relation to the cosmos, was somehow comforting or at least distracting, wrenching my mind away from my weariness. By the time I reached the car I felt surprisingly content. Today I had an email from Rob saying that he had had a peaceful sleep in the igloo and that before retiring to bed they had stood outside star gazing. I was glad to know the igloo had been a success. 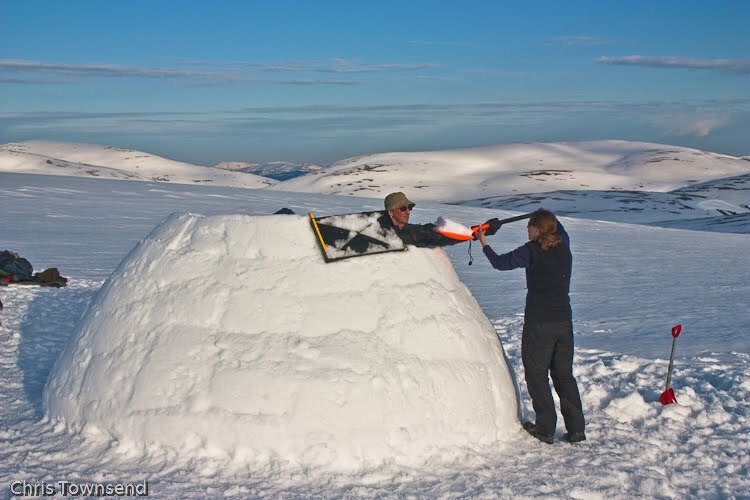 Photo info: Building the igloo. Canon EOS 450D, Canon 18-55 IS at 28mm, 1/1000@f5.6, ISO 100, raw files converted to JPEG in Lightroom 2.6. That's brilliant, Chris! Hope you enjoyed the igloo. I haven't made one yet, but maybe next year I'll get one of the tools. thats the thing with stargazing, the realisation that we are nothing and yet, something all at the same time. if that makes any sense!!!. Chris, nothing to do with this post (love the igloo though - wish we had the snow for them down here in Hampshire), but did you get an e-mail from me on Thursday last week? I used the address from your contact link. Sorry, don't know how else to get in touch. That sounds and looks brilliant... would love to have a go next winter. Maybe we can organise something Paul. Paul, remind me when there's snow again next winter. Sorry for the misinformation Mark. I'm not sure where that came from! beacons in the mail yesterday, so we are definitely getting excited for the hike!